(Nanowerk News) Lithium-ion batteries are common in consumer electronics. They are one of the most popular types of rechargeable batteries for portable electronics, with a high energy density, no memory effect and only a slow loss of charge when not in use. Beyond consumer electronics, lithium-ion batteries have also grown in popularity for military, electric vehicle and aerospace applications. Now, researchers at Arizona State University are exploring new energy storage technology that could give the battery an even longer life cycle. Led by Dan Buttry, professor and chair of ASU's Department of Chemistry and Biochemistry, the research also involves former undergraduate researcher Jarred Olsen and current graduate student Tylan Watkins. Olsen joined Buttry's group as an undergraduate researcher to work in the ionic liquids area. The work he contributed to this study was performed while he was on an internship at Boulder Ionics working at both Boulder and ASU with Watkins. Olsen is currently a doctoral student at the University of Washington, Seattle. 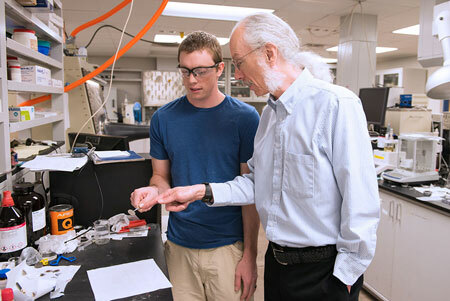 Dan Buttry, professor and chair of ASU's Department of Chemistry and Biochemistry, examines a battery sample with graduate student Tylan Watkins. The research, just published in Nature Communications ("Stable silicon-ionic liquid interface for next-generation lithium-ion batteries"), brings together scientists from Arizona State University, University of Colorado at Boulder, Sandia National Laboratories, Boulder Ionics Corporation and Seoul National University, Korea. Room temperature ionic liquids have attracted a great deal of interest in recent years due to their remarkable physicochemical properties, including high thermal stability, wide electrochemical window and low vapor pressure. "We used a device called a quartz crystal microbalance to measure very tiny mass changes in thin films at the surface of the battery material during charging and discharging," said Buttry. "One of the key features of successful lithium battery materials is that they develop thin films that protect the surface of the battery electrodes, which prolongs the life of the battery. This study documents the development of just such a film in a new type of battery formulation that has many more attractive features than existing commercial lithium batteries." Buttry added: "The hope is that this new formulation will find its way into commercial use." The work is part of a larger effort in Buttry's lab that has included funding from the Advanced Research Projects Agency -- Energy (ARPA-E) and now from the Army Research Office. "These were not trivial measurements to make because composite films (meaning a film of the active material in a polymer matrix) are often difficult to use with a quartz crystal microbalance," said Watkins. "Most, if not all, quartz crystal microbalance studies of this sort use very thin films of the active material alone, which means specialty deposition methods must be used. What was cool here is that we were able to make the measurement on a more practical film, something you might realistically see in a commercial battery." This work provides new science related to the interfacial stability of silicon-based materials while bringing positive exposure to ionic liquid electrochemistry. By combining a high-performance silicon electrode architecture with a room temperature ionic liquid electrolyte containing the new bis-fluorosulfonylamide anion, the researchers demonstrate a highly energy-dense lithium-ion cell with an impressively long cycling life, maintaining over 75 percent capacity over 500 charge/discharge cycles with almost perfect current efficiency (no wasted electrons). "This study brings home the fact that energy storage technology still has a lot of room to run, with new technological changes coming at a fast pace," says Buttry. "This is important when considering areas where storage is important, such as grid storage and electric vehicles." According to Watkins, there are a multitude of reasons why modern society demands more energy dense batteries. "For some time, silicon anodes have been proposed as replacements for the carbon based anodes found in current state-of-the-art devices as they could potentially give energy densities almost 10 times that of modern anodes," Watkins said. "This exciting collaboration could bring us one step closer to realizing more energy dense batteries with silicon anodes."